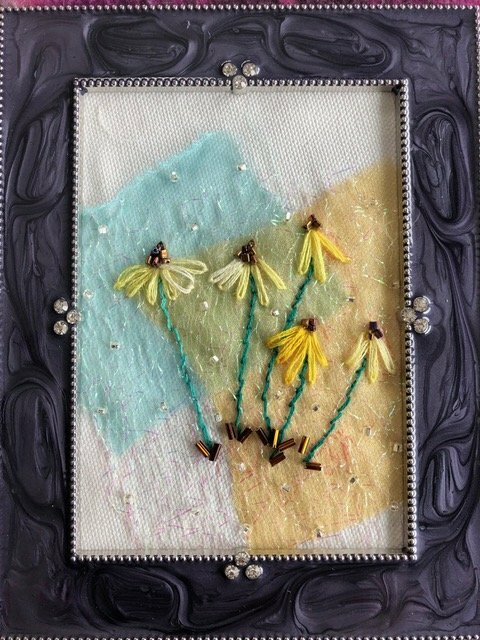 This class will teach your three basic embroidery stitches that you will use to create a floral design. This design is then layered together with a chiffon or organza overlay with the finished product being mounted in a small frame. You can add beadwork to create a truely beautiful piece of art! This class is perfect for beginners ages 12 and up! There is a minimum of 6 needed for this class, so grab a friend and spend a morning creating! Other materials to be provided by Norrie for $3. Please bring cash to class! *if we do not meet the minimum number of students, we will cancel class 2 days in advance and refund your class fee.